As a Bottlenose Dolphin swims within feet of the bow of a dolphin watching vessel in the Bay of Islands, New Zealand, passengers lay flat across the bow to capture the best pictures. A favorite past time for a Bottlenose Dolphin is to surf along the wake or bow of a boat which allows passengers aboard a dolphin watching vessel to capture a close up picture while visiting the Bay of Islands, New Zealand. 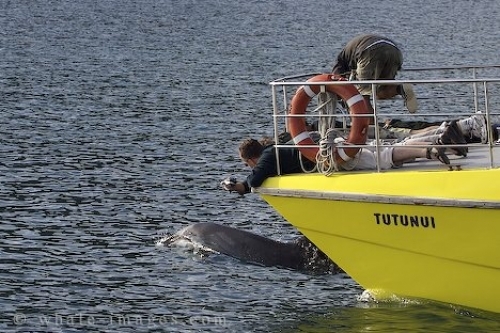 Some of the passengers aboard the Tutunui, lay flat on the bow of the boat, push their heads beneath the front rails and lean over the edge to ensure they have the best view of the Bottlenose Dolphin as it surfaces. In the Bay of Islands off the North Island of New Zealand, the Bottlenose Dolphin is one of the most common marine mammals seen in these waters as there are about 450 which travel the area. Locating the dolphins is sometimes challenging as these animals vary in their locations depending on their whims and feeding patterns. This vessel, the Tutunui, is ideal for dolphin watching as it is built for cruising amongst the dolphins and other marine life as it is jet propelled and will not cause danger to any marine mammals. As the Bottlenose Dolphin swims alongside the boat, he rolls and turns to peer up at the passengers with his dark, round eyes. The Bottlenose Dolphins are various shades of gray with an underside which is almost white and have an elongated upper and lower jaw and a single blowhole on top of their heads. Averaging about 6.6 to 13 feet in length and weighing between 300 and 1,400 pounds, these animals usual travel in smaller groups of up to 15 animals. They often group together with other pods and travel amongst the waters in the Bay of Islands off the North Island of New Zealand. The crew aboard the dolphin watching vessel, the Tutunui, are extremely knowledgeable about the Bottlenose Dolphins which includes their behavior, identification and where they tend to travel around the Bay of Islands. A tour that is well worth it while visiting the North Island of New Zealand. Bottlenose Dolphin Tour, Bay of Islands, North Island, New Zealand.